Reagan is always ready to paint! 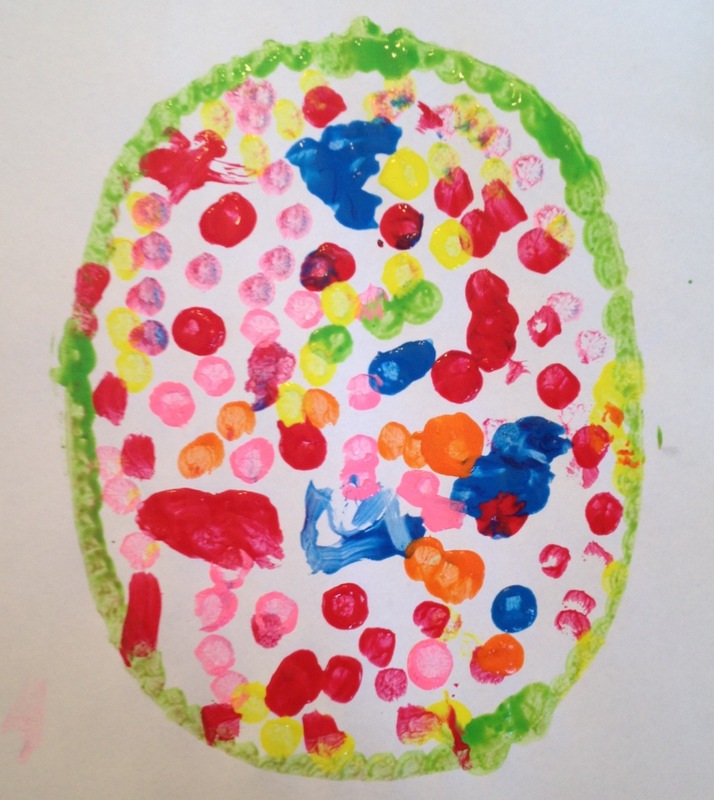 Color identification, color recognition and fine motor skills are all put to good use throughout this craft! 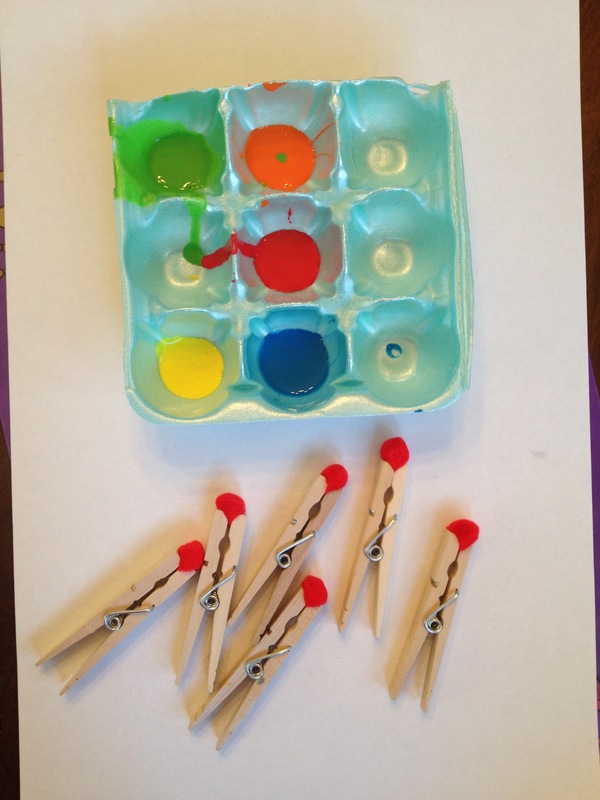 Pinch Pom Pom ball and/or cotton ball with clothes pin. 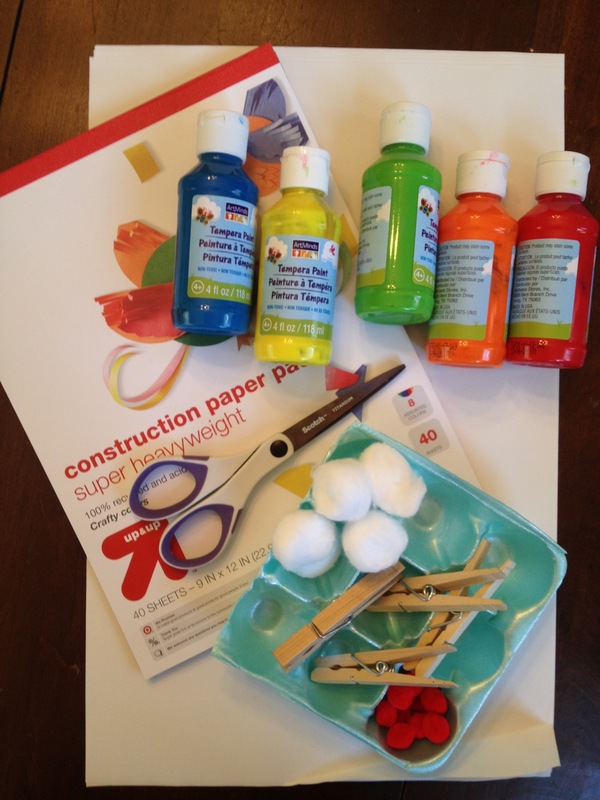 Squeeze different colored paint into separate egg shell carton sections. 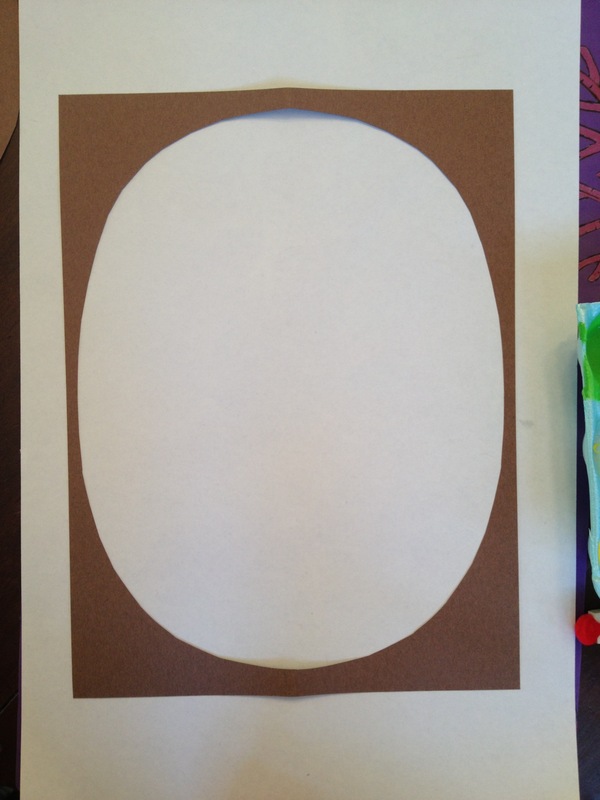 Fold a piece of construction paper in half and free hand cut out the shape of half an egg. 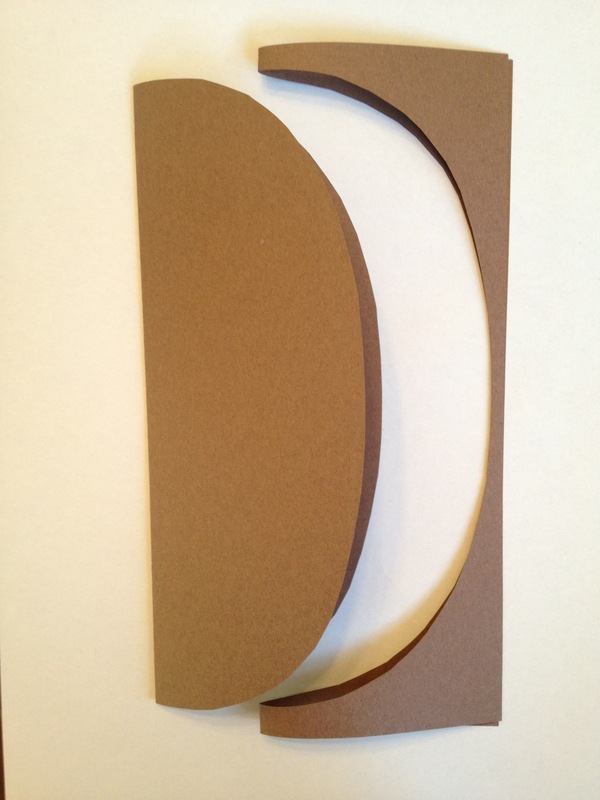 Hold the cut out against a piece of larger white paper. 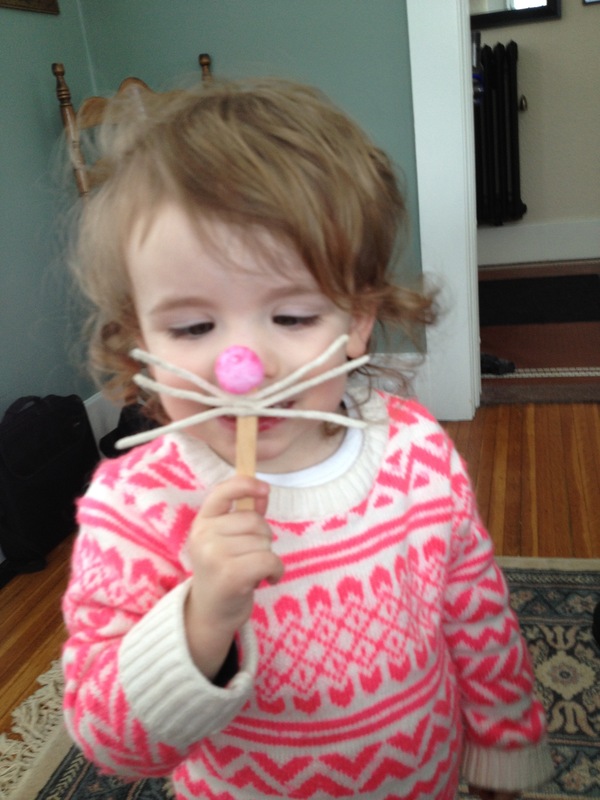 Designate one clothes pinned Pom for each color, which probably won’t last for long- Reagan was mixing colors within the first few minutes. 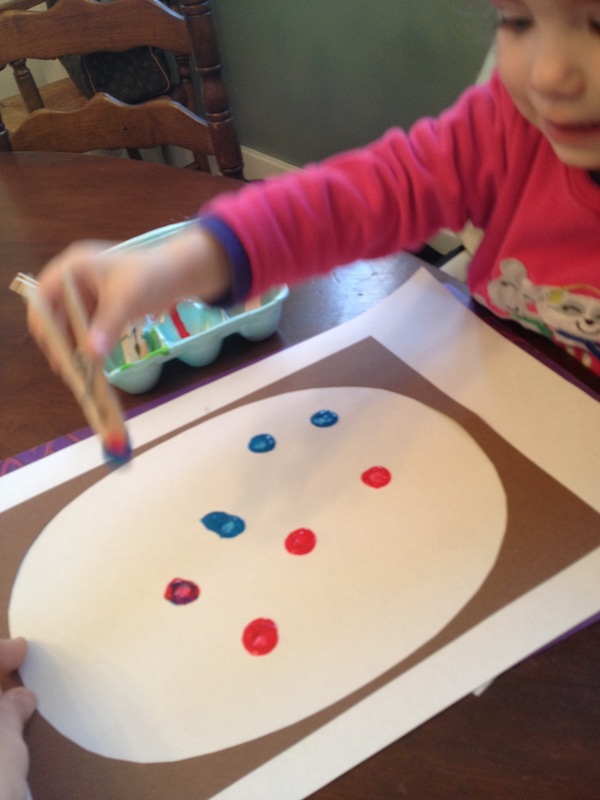 Assist your child in making dots, swirls, and whatever other designs they can create with the pinned Pom. 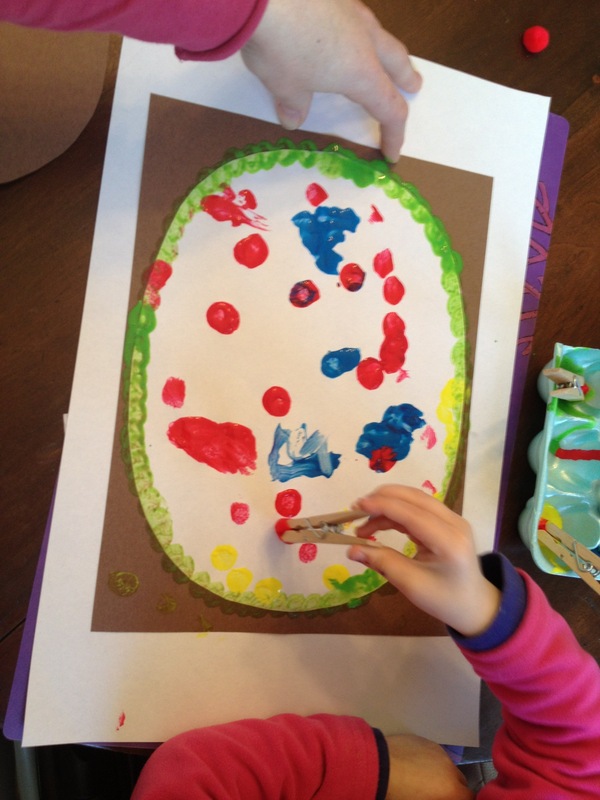 I found that I needed to create a boarder around the edge of the construction paper because Reagan wasn’t completely filling in the egg. 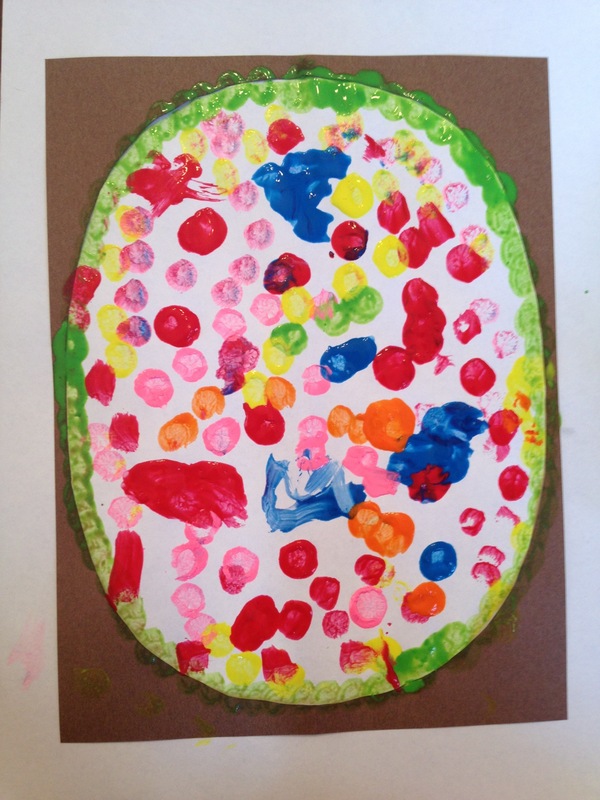 When they have finished painting, lift off the construction paper stencil and allow the egg to dry! This Irish Bread Braid from Best Yummy Recipes, is super YUMMY! I used their cut finished loaf picture, because my loaf got cut and eaten before I had the chance to grab a pic. I went out on a limb with this recipe, on the search to find something, anything that my daughter will eat other than pizza. Neither my husband nor I are corned beef fans, however, the finished product photo from Best Yummy Recipes looked so delicious, that I just had to taste this bread! My braiding wasn’t too successful, I had to open a separate can of crust to patch holes, but other than that, this recipe was a cinch! The original recipe calls for Pillsbury Recipe Creations seamless dough sheet, which my grocery didn’t have, so I used Pillsbury Thin Crust Pizza. I purchased two cans, just incase one wasn’t enough, which it wasn’t. I also substituted the 2 red potatoes for 1 baking potato, because that’s what I had on hand. I’m not a huge fan of caraway seeds, so I negated them from the ingredients. 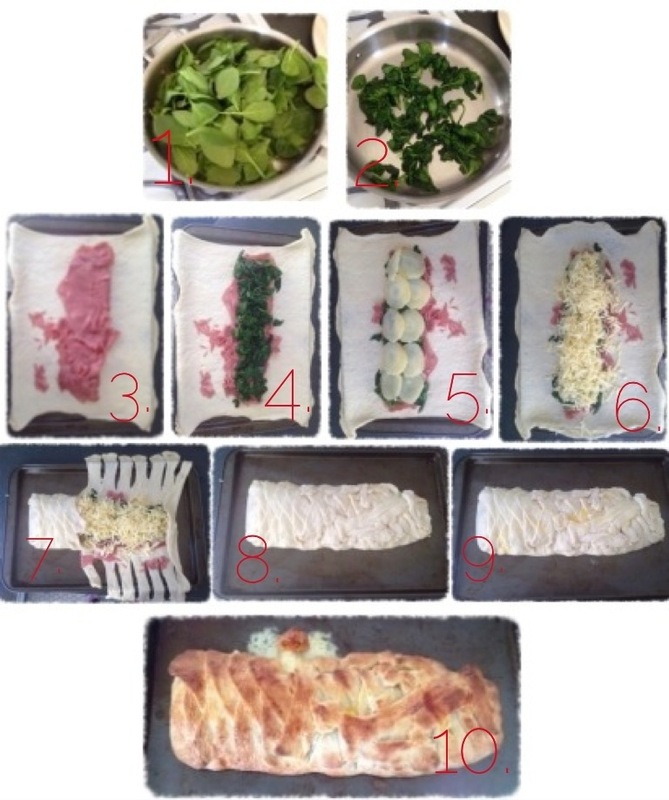 Prepare your potato before beginning this recipe to allow for potato to cool. I peeled my potato, boiled whole for about 10 minutes, allowed to cool and then sliced thin. 1. & 2. In a pan heat olive oil, add spinach, cook stirring continuously. 3. Spray cookie sheet lightly with cooking spray, unroll pizza crust onto sheet and add corned beef down the center of the dough. 4. Top corned beef with cooked spinach. 5. 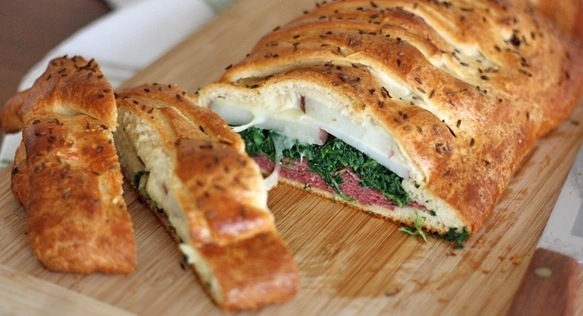 Top spinach with potato. 10. Bake bread at 375 degrees for 25 minutes, or until the bread is a lovely golden brown. Allow to cool for 5 minutes before cutting with a sharp knife. Even though my daughter didn’t want to even taste the bread, my husband and I thoroughly enjoyed it! Give it a try, you’ll be glad that you did! Mom and I are off to Spain on Friday to visit our brother Dan! My new camera will make it more challenging to be a secretive tourist but the pictures will be well worth it. In choosing a camera bag last week, I couldn’t commit to anything expensive yet so at just $10, this one will serve the purpose perfectly for this trip. A comfortable shoe, breathable clothes and minimal jewelry are my travel staples along with extra sunscreen and water. We used the Top 10 book last year in Istanbul and it was perfect because it lists the Top 10s of everything in the city (museums, restaurants, neighborhoods) with pull out maps but is also slim enough to fit in any bag which make them the perfect secretive tourist companion. The weather forecast calls for high 70s and clear skies throughout the majority of our trip and is just what the doctor ordered after this brutal winter. 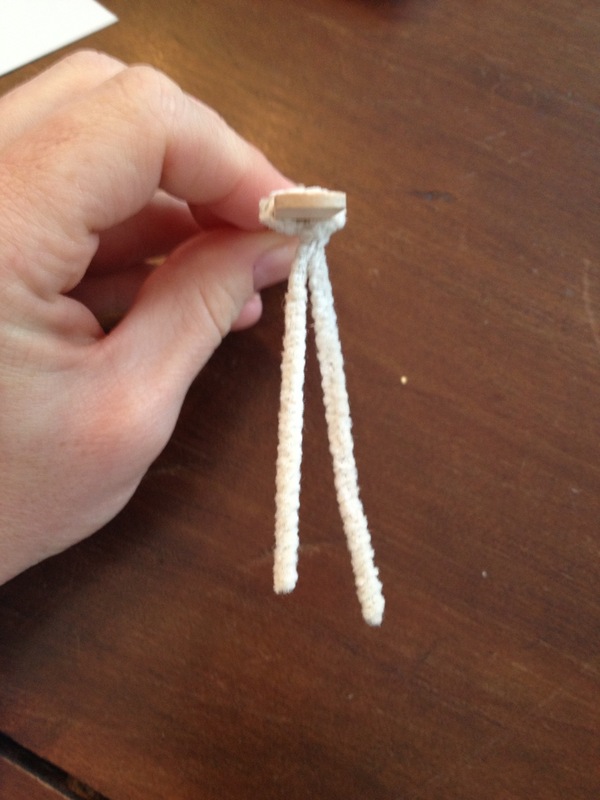 A super easy craft, that can be added to the dress up box! 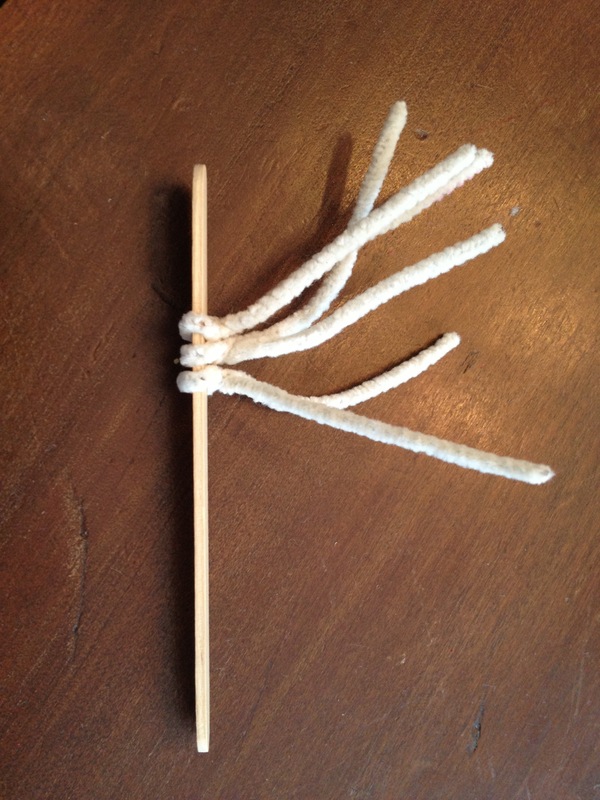 Lay pipe cleaner horizontal on the table and place Popsicle stick in the center. 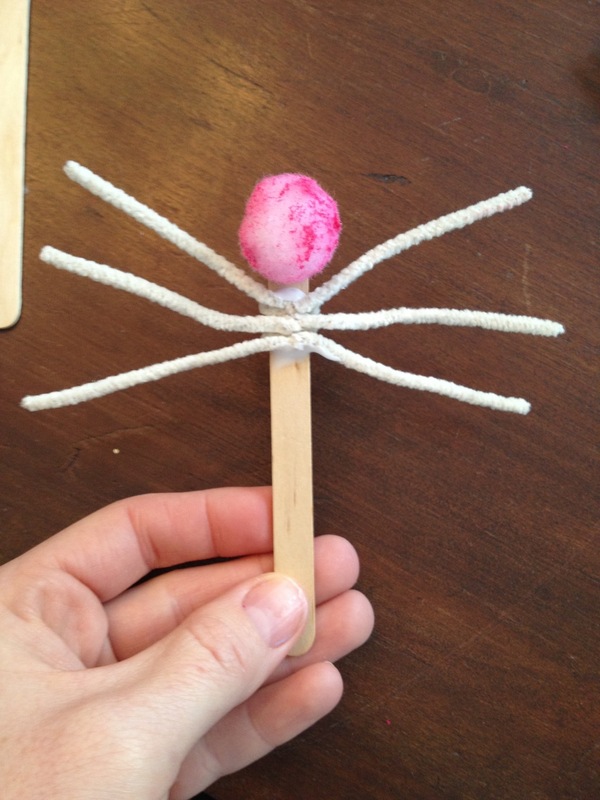 Bring ends of pipe cleaner together and twist twice to secure towards the top of the Popsicle stick, leaving enough room at the top to glue the Pom Pom ball. 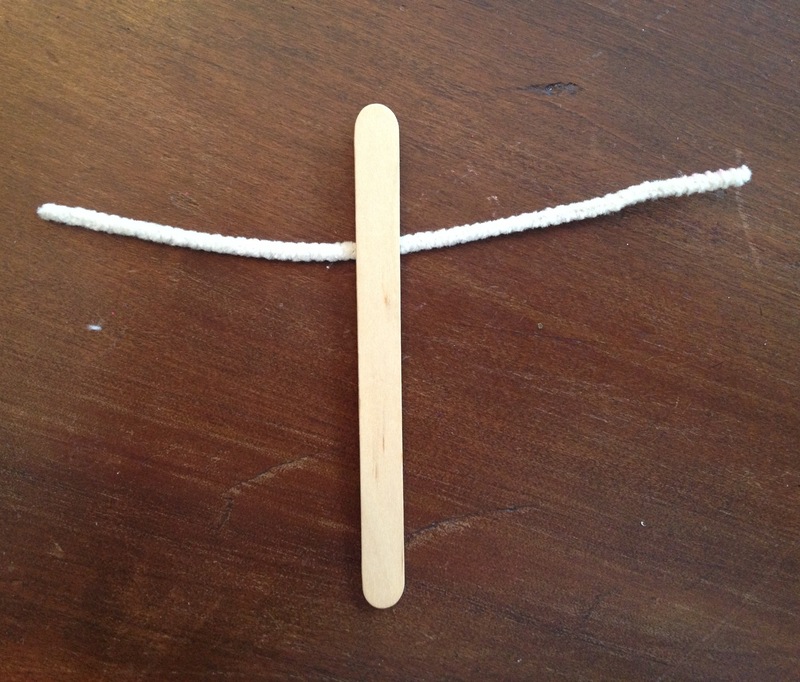 Repeat with two more pipe cleaners below the first. 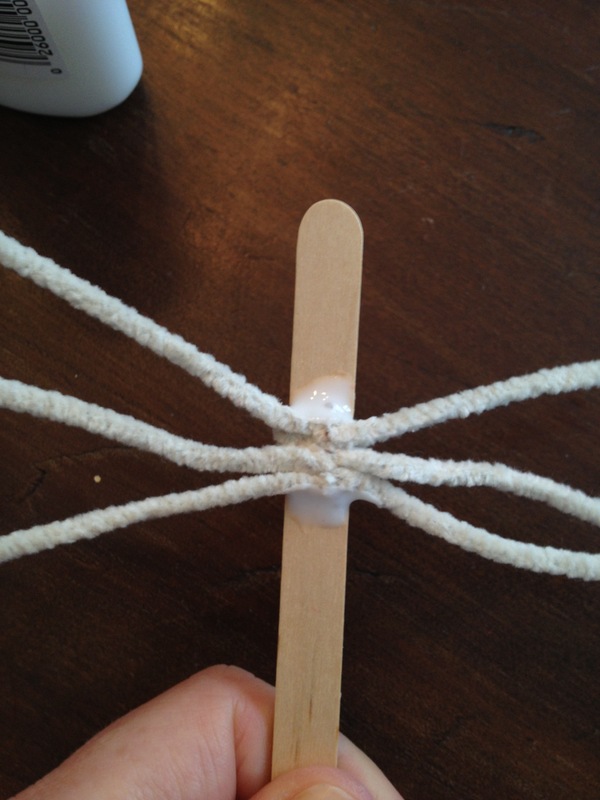 Add a squeeze of glue above the top pipe cleaner and below the bottom pipe cleaner. 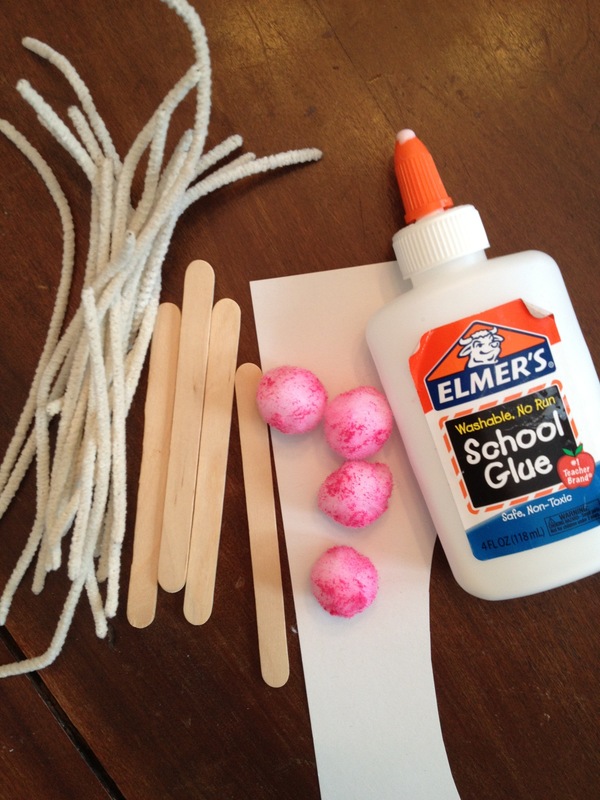 Glue the pink Pom Pom ball to the Popsicle stick, above the pipe cleaners. Allow to dry. Andy surprised with me a new camera last week as an early birthday gift just in time for my trip to Madrid next week! 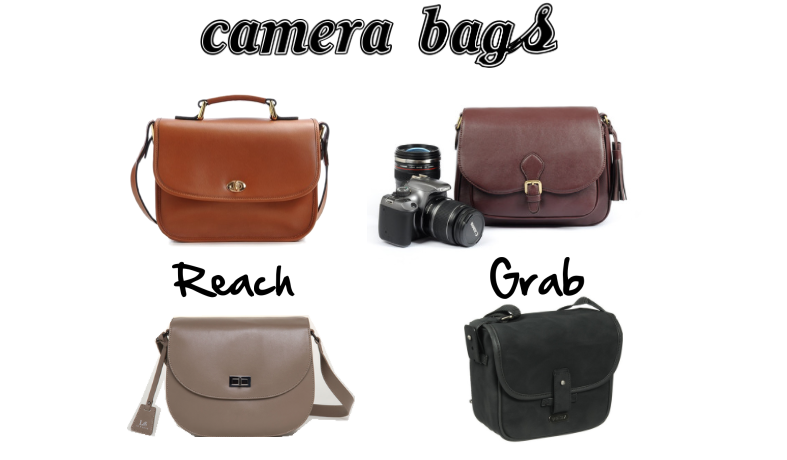 I am on the hunt for a great but not outrageous camera bag that will be stylish enough to carry around without looking like a news reporter on top of being a tourist. Just as with all their products, I love the Lo & Sons one but it’s not what I want to spend and am looking for similar options with a cheaper price tag. What do you use?